What Really Motivates Your Work? The Tower of Babel (Vienna) By Pieter Brueghel the Elder. Public Domain, Wikimedia Commons. All of us engage in work each day, whether or not that work receives financial compensation. We sell products, build houses, teach students, mow lawns, govern cities, supervise staff, preach sermons, carve sculptures, and change diapers. Why? What motivates us to do our work . . . really? For most of us, work is essential for self-preservation, for making sure that we have food to eat and shelter over our heads. Many of us also work to care for our families. When we look beyond work as a means to support physical life, we are motivated by a variety of needs and aspirations. Perhaps we work in order to ensure our future security. Or, maybe we work because we love the things we can buy with what we earn. Work can be a source of self-esteem or a way to feel as if our lives matter. For some of us, work expresses our sense of purpose. It’s a response to God’s call upon our lives. Our work is motivated by our faith, by our desire to please God and cooperate in his work in the world. In Genesis 11, we see another motivation for work. The people who settled in the land of Shinar (a region somewhere in modern-day Iraq) learned to make particularly strong bricks. With these bricks, they sought to build a giant tower “with its top in the heavens” (11:4). But they weren’t seeking merely to get a panoramic view or even to gain advantage over their enemies. Rather, the builders said to each other, “Let us make a name for ourselves” (11:4). They were motivated by a desire for a widespread reputation, for global glory. They built their skyscraper because of pride. God, as Genesis 11 reveals, was none too pleased about this. He wasn’t upset simply because the people were building something. This effort could have been a faithful response to the divine command to be fruitful, multiply, fill the earth, and steward it (see Gen 1-2). Rather, God was concerned about the prideful motivation of the builders and about how their success would propel them to seek even further power and glory (11:6). So, God confused the language of human beings, in this way preventing people from succeeding in their effort to glorify themselves. If they couldn’t communicate clearly, they couldn’t collaborate effectively on their building project. 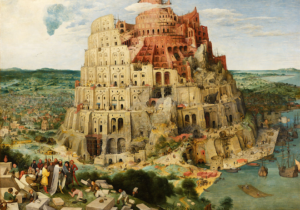 There is much in the story of the Tower of Babel that is curious, even perplexing. We won’t be able to sort it all out here. But what strikes me today is the question of motivation. I wonder: Am I like the builders from Shinar? Am I working primarily to make a name for myself? Why do I do what I do? What is really behind my work? As I consider these questions, I would invite you to join me. Are you working primarily to make a name for yourself? To what extent is your work motivated by pride that leads your heart away from God? What motivates you to work? What keeps you going when you’re tired or discouraged? To what extent does your faith prompt you to work? Gracious God, you have made us to work. You have made us with the ability to take joy in our work, to feel the delight of a job well done. Through our work, we can glorify you and share in your own work. These are gifts for which we thank you. But, Lord, sometimes we see our work as a way to glorify ourselves primarily. Like the builders of Shinar, we want to make a name for ourselves in a way that would turn our hearts from you. Forgive us when our motivation for work is what it should not be. Help us, we pray, to work for your purposes, to take delight in what our work produces as it glorifies you. Amen. This post originally published on September 4, 2015. Thanks, David. I love that answer!